Sermon Podcast: How much is enough? You'd better believe I climbed those stairs up to the pulpit extra carefully for my first sermon last Sunday! 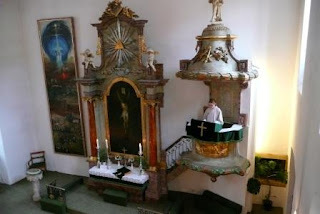 I thought I heard (maybe on my January term trip) that the International Congregation didn't use the high pulpit, but Pastor David in fact does because the whole church is kind designed for it ... unless you're sitting right in the front row (neck cramp!) it probably the easiest way for pastor and congregation to see each other in that space. I am probably going to trip at some point; I am planning to do so with good humor. The sermon is about forgiveness, which I think is a difficult topic. I welcome your feedback, in the comments or via email. Help me learn and grow! Grab our podcast or download the sermon text or audio here. It is the feast day of Our Lady of Sorrows, patron saint of Slovakia and a national holiday. Sean and I are listening to Morning Edition via whyy.com at almost 3pm, getting ready for school tomorrow and still recovering from a whirlwind week (teaching, sermoning, etc.) It's been raining lightly all day, a gentle, welcome tapping on our windows that makes me glad to be inside, warm and cozy. I love days like this, especially after it has been so brutally hot. Water can be comforting, joyful, renewing, and such a relief. Water is also powerful and frightening. 6 hours after I gave a children's message on the joyful experience of using water to remember our baptism, Pastor Kristi at St. Luke's responded to terrible flooding in Park Ridge with a sermon on Noah, and God's rainbow promise to never destroy the world. Water has as much potential for destruction as it does for sustaining creation--it is absolutely essential to life and can be absolutely deadly. God uses this powerful sign to make powerful promises to humanity: you will not be destroyed, you are my children, you are forgiven. Lots of prayer requests on my mind today! Let us pray for the search and rescue workers in Galveston and for everyone still waiting for them. Let us pray for everyone trying to get the basics in Houston: power, drinking water, gasoline for generators, food. May the relief efforts reach and assist them in their times of need. Let us pray for everyone cleaning up from flood damage in Park Ridge, especially Katie and Phil as they also prepare for their wedding this week. Bless the members of St. Luke's as they remember God's rainbow promise. Let us pray for everyone in the South and Midwest impacted by Hurricane Ike--bless relief agencies and home and business owners who will be "in it for the long haul" for recovery and rebuilding. Let us give thanks for God's life-giving gift of water: water used for cleaning up after storms, to sustain the people who are in the midst of recovery, and to remind all of us that God loves us, forgives us, and gives us new life. I talked to my parents last night--the basement of their condo building (the parking lot and storage area) was flooded 10 inches, and some of the items they had in storage were damaged or destroyed. They don't have power or hot water and my mom is on a big deadline for work ... they were keeping positive, but please keep them in your prayers, too. 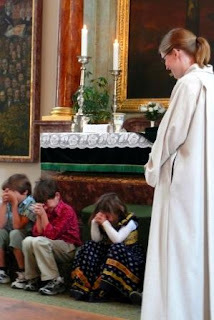 Here's a picture of us praying at the end of the children's message, yesterday. We had so much fun sprinkling water on the congregation! You can see the kids are suppressing giggles, here. Water is a lot of fun when it isn't in hurricane form. We're going to post the text and audio of my first sermon at Bratislava International Congregation soon, but until then, check out the pictures here. Which candidate would you rather have dinner with? Yesterday Sean and I went to the American embassy (which is really a very pleasant place to go when your passport is already blue) and they mailed in our absentee ballot requests for us. I swear I was already filling out the forms when Sean found this Craig Ferguson clip, but I have to admit, it did inspire/exhort/shame me into actually following through that very day. Pretty great, right? I'm very excited to get my ballot--now that we're online and a little more settled we're back to following the election news. Lately we've been reading articles to each other in the evenings, which isn't as sweet as when we used to read each other Sherlock Holmes stories before bed, but I'm enjoying it. Tomorrow is my first time preaching at Bratislava International Church. I will also give a children's message ... =). Of course I'm nervous, but in that "this is really happening and now it's started and that's a good thing" kind of way. Today I had a wonderful meeting with Pastor David about my sermon, and right away he highlighted the areas of preaching I need to work on: using clear transitions, writing for speaking rather than reading, writing a sermon rather than an essay, fully illustrating my examples rather than assuming my congregation will have the same background information I do. I feel like I'm already learning so much on this internship ... and as of today, we've been here just one month. My parents taught me this mantra when I was quite young and I've spent most of my life repeating it (because it's true): I'm a lucky girl. Back to improving that first draft! Keep me and the congregation in your prayers tomorrow--the topic of the sermon is forgiveness, which is a tough one, to be sure. Sean's quote (which I'm using in the sermon): "If forgiveness were easy, we wouldn't need Jesus." This is most certainly true! Many things here are familiar, or at least, it's not such a stretch to adapt to the differences. But when we want to impress our friends and family with an exotic factoid, we tell them about "sweet lunch." "Sweet lunch" is a phrase we learned during orientation, used to describe days when dessert is served as an entree at our school cafeteria. Jelly donuts, pirogis filled with blueberry and dusted with chocolate, and spaghetti noodles covered with chocolate sauce are all sweet meals we'd seen or heard about. We went for a long time without directly experiencing it, though, and the anticipation made it take on mythic significance in my mind. Our first real sweet lunch experience occurred on Monday--and it was really no big deal. Our friend and colleague Peter described it as "dumplings in vanilla cream": the dumplings were like pieces of challah bread, and the cream sauce was like a thin sweetened condensed milk ... not too sweet at all, and the bread was lovely and satisfying. Also lovely was the soup, which featured very hearty and protein-rich beans and sausage (yay!) and a piece of watermelon for dessert. My old fears about getting a balanced meal were banished and replaced by fears about whether or not I could balance all three plates on one tray--the women at the lunch counter and I had a good laugh as I tried to figure that out! ...except that I really should be writing my first sermon, which is coming up on Sunday. I'm excited for the opportunity to preach here! I've got a hymn of the day picked out, which is a good start, and some good thoughts that are making their way to the page. It's official! I was installed today as Intern Pastor at Bratislava International Congregation. During a particularly moving moment I started to tear up and couldn't help thinking, "Oh no ... I've got to sing right after this ...pull it together, Annie!" There is grace and I am grateful. You can find the audio of that portion of the service here. So, remember what I said about keeping the windows open at all costs? Not tonight! It is raining furiously ... a completely amazing storm to cap a completely amazing week. I am going to make this quick so I can hop into bed while it's still raining, thundering and lightening-ing with intent. It's just about my favorite way to fall asleep, and living up in the attic as we do gives us a front row seat to all kinds of fireworks. The first week of teaching went well, but I'm too interested in getting a good night's sleep before starting the second week to say too much more about it right now. My students seem, as promised, really bright and ready to discuss and debate the big topics--it feels good, and gives me lots of good energy, to be teaching again. OK, I missed the storm, but I'm still pretty motivated about this reasonable bedtime thing. Dobrú noc! 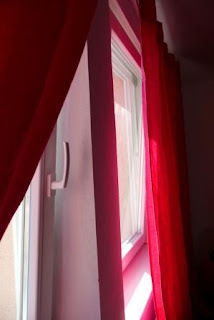 I took this picture to show off our latest project: curtains for our bedroom windows. Hooray for privacy! (What a funny thing to write on the Internet.) Anyway, we love them--when we close them during the day the room has a warm, red glow that I think will be especially cheerful as it gets colder. *thoroughly enjoying that slightly-chilly feeling of the mornings and evenings: perfect for snuggling or curling up with tea, a prayer shawl and a book. *taking in the sounds of the city: busses and trolleys, classical music sing-alongs, wild parties late into the night (this can get a little old, but I have earplugs), cats in the courtyard, church bells near and far, fireworks for the holiday weekend. When we heard the fireworks we ran up to our roof-top balcony ... we really do have a great view! I've lived in big cities before (Houston and DC) but never right in the heart of the city like this--as much as I loved getting out of the city for an afternoon this weekend, living in the middle of it all suits me best, I think. *living with pesky bugs. This wasn't so bad, at first, but as the weather gets colder the mosquitoes and bees are getting more aggressive. We take this as a sign of desperation and believe that our victory is near. Well, as near as the first real cold snap. They're just doing their buggy thing, feeding their babies with our blood, etc. We're just trying not to encourage them too much. So, other than the bees and skeeters--which do add an element of excitement to our lives--we're loving the open windows. I listened to the bells today and wished I had our audio recorder set up to get all the great ambient sound. We'll have to capture some of that for our podcasts. Podcasts may have to wait a bit--tomorrow begins a very busy week. The first week of school! Also, I'll be installed at the intern pastor at Bratislava International Congregation on Sunday. Lots of good things in the works; we'll report back as we can. But first: I promised I'd report our first cooking or baking failure. We tried to make boiled ham, cabbage and potatoes tonight: the ham turned into a mass of inedible goo. We have no idea why this happened--perhaps the properties of ham are different here? Resistant to boiling? We ended up having a lovely cabbage and potato appetizer, followed by a delicious Tesco brand pepperoni pizza and a couple slices of freshly baked banana bread. Well-recovered! Quote of the night: "Sacrifice the ham to the bees!" "They don't want it, either." Goodnight! Blessings on everyone returning to work after the holiday weekend, and to students and teachers going back to school!